Ran alone this morning. Standard 10.04 course. Eventually eased into sub-7:00 pace. HR stabilized at 125. Hit the first half in 35:35. On the way back ran the standard 2.5 mile tempo. First 1.25 at 5:40 pace, all quarters 1:25 exact. That for some reason felt brisk in a way, I would not have called it relaxing, but at the same time I felt no urges to run slower. HR fairly quickly, quicker than normal made it to 155. Then I shifted gears into threshold gear. First quarter in 1:21. Thought the uphill one would be 1:23, or 1:22 at the very best, but I ended up with 1:21 again, and felt strong. Another one, which still rolls unpleasantly was 1:21. Earlier I thought maybe I was just being too feisty but now I started to gain confidence in the new level of fitness. Next quarter in 1:20, and kicked it a bit on the last one - 1:16, 13:44 for 2.5 and 5:18 on the last mile. Even caught the 5:30 guy at the very end and beat him by 1 second. This in and of itself is not a super great accomplishment except that I have been doing this run weekly putting in essentially the exact same effort, and getting the exact same results over the last month or so. I did not feel like I mentally put in any more effort than I did before. What is interesting is that my HR shot up from 155 to 164 within about 0.3 from the time I started running threshold effort, and then eventually maxed out at 169. This HR response was accomplished without extreme mental effort. I also felt that I had the ability to make my legs sore. This may sound like a joke to others but it is a big deal for me. I often find myself in a prize money race in a situation where a little bit more in effort results in quite a bit more in money. I try every imaginable method to push myself to the limit, but the body gives no response. After the finish, the legs feel fresh, and I do not feel tired at all. The feeling in the tempo was somewhat comparable to running in Arizona in the Del Sol Relay on the first leg. I was running 10 seconds per mile faster than I would have on the same terrain in Utah with the same perceived effort, and I was able to push my HR higher. At this point I feel inclined to attribute the change to a better functioning of the nervous system in response to my efforts to keep blood sugar at a decent level throughout the day. Finished 10.04 in 1:07:22. Ran a mile later in the morning, half with Julia running and Jacob in the stroller, the other half with her in the stroller as well. Ran another 4 in the afternoon, 1.5 with Jenny, 1.5 with Benjamin, and 1 back and forth watching them play in a park. Ran with Jeff McLellan this morning. We warmed up 2.34 very leisurely, then did 4x400 with full rest (very slow 400 meter jog) on the trail on the standard quarter workout stretch going towards the lake (faster direction, but still about 1 second slower than the track). First in 69.1, I was surprised, did not think we'd hit sub-70 on the first one. Then another surprise - 66.2. One more surprise - 63.2. That one felt fast, but at the same time had somebody told me to finish the 800 when I had 30 meters to go, I could have been coaxed into it. Enough surprises. I've got a race tomorrow. I told Jeff I wanted to relax on the last one, although it was tempting to blast it out to try to bring the average under 65. We did it in 69.4. Then we ran 5.93 for a cooldown. Started out at slower than 8:00 for the first mile. Then gradually picked it up as the lactic acid from the workout began to disappear and worked our way to 6:40 pace at the end. Ran 1 mile with Benjamin and Jenny in the evening pushing Joseph and Jacob in the stroller in 9:03. Then ran 4 more miles with Jacob and Joseph in the stroller in 30:16. Started out at slower than 8:00 then eventually worked my way to 7:00 pace at the end. Sandy Classic 10 K tomorrow. The goal is to be in pain for the majority of the race. If I can do that, the time and the place will come. Sandy Classic 10 K, 35:15, 5th place. Drove up with Benjamin. He ran the 5 K in 23:20 according to his timing. At the start we had Paul Petersen, Hobbie Call, Nick McCombs, and Vance Twitchell . Hobbie took off fast enough for Nick, Paul, and Vance to not want to follow, and they in turn took off fast enough for me not to want to follow. So I ran the whole race in no man's land. My goal for the race was to be in pain. I miserably failed to reach it. No matter how hard I tried, I could not sustain a pace that hurt. Could not get my HR above 161. It felt like a slow half marathon. On the positive was able to pick it up on the last quarter a bit - hit 5:03 pace according to the GPS. I also felt strong during the race and hit fairly even splits. My Garmin 305 showed the race to be 6.28. I noticed that both times going around the South Town Mall my quarter splits started getting very slow even on the downhill sections even though I felt I was maintaining good turnover and the heart rate did not drop. Then the splits went back to more believable values on the straight stretches. The official times have not yet been released, but Hobbie was around 31:30, Nick around 32:15-32:30, Paul timed himself at 33:03, and Vance was around 34:00. It puzzled me for a while why the times were so slow on this course last year. The course is hilly, but not as bad as Salt Lake Classic. I even suspected that Bill had made a mistake in the measurement of the course after I did a rough map of the course on the Course Tool. However, after redoing the map with nearly perfect tangents, I figured out what was happening. This course is laid out in such a way that running the tangents perfectly is nearly impossible (having slow 5 K runners only 10 minutes in front does not help either), and the loss from improperly running tangents is very high. After the race, Benjamin and I rushed home as we were participating in the parade in Provo. After the parade ran 1.1 to get the car. In the evening ran 0.5 with Julia, 1.38 with Jenny, and then 6.3 with Jacob in the stroller averaging 7:00 pace. Made some improvements in the Course Tool. For one, fixed the missing elevations in the courses. That shrank some courses, particularly Summer Games 10k because now you are not taking a vertical dive to sea level right in the middle of Cedar City. Need some empirical data. I am fairly certain that grade adjustment is a function of the elevation you are at. Right now the Course Tool uses the data I collected in Provo, so it is for 4500-5000 feet of elevation. What I need is to have as many people as possible that could measure out a course on a grade at various elevations, and run it back and forth at a hard, but reliably repeatable effort several times back and forth on the same day (eg. 10x400 alternating up and down). Ran alone this morning on the standard 10.04 course. On the way out got 36:47 at a fairly even pace after a very slow warm-up quarter in 2:10. HR did not get above 124 although it started getting warm. On the way back, felt like a short tempo to make things interesting. Decided to run a relaxed marathon pace effort not worrying too much about pace as long as it was faster than 6:00 for 2.25, and then sprint on the last quarter to see what I'd get. Did the first quarter in 1:29, then eased into a slightly over 5:40 pace. Ran the last quarter in 71, which gave me 14:04 for the run, 2:36 for the last 0.5, and 5:29 for the last mile. HR made its way to 154 prior to the kick. Total time for 10.04 was 1:09:33. Ran 0.5 with Julia later in the morning. In the evening ran 3.25 to DI and back. On the way out pushing the double stroller with Julia and Joseph, and accompanied by Benjamin and Jenny. On the way back, pushed the double stroller with Joseph and Jenny, and directed Benjamin as he pushed Jacob in the single stroller. Julia and Sarah ran/walked back behind us. This was quite a procession! Afterwards added another 3.25 at 7:30 pace. I am getting really odd results from the high mileage. HR at speeds slower than marathon race pace is down - that is to be expected. Threshold is not moved and sometimes I cannot even sustain it for long, pace, breathing, or HR-wise. However, the top speed is slightly better and easier to reach, and my kick at the end of a tempo run has improved. Has anybody observed anything of the kind, or would have an idea of what is going on? Breakthrough workout this morning. Finally it is starting to smell like the Trials. I would not say a Trials Qualifier is in the bag, but using a soccer analogy, before I had to pass a couple of very good defenders and then trick the goalee, while now it is just the goalee. Ran with Nick and Jeff. Standard 5 mile tempo. Was not expecting much starting the day with 64 miles on the odometer for the week already. Last night I felt sluggish. So the plan was to run all of it at 5:40, slower is OK if 5:40 feels too hard. Then a kick with 400 to go. This would measure how hard the tempo really was and give a very reliable indicator of fitness without actually pushing it over the top. Felt sluggish in the warmup. Then we started the tempo. First quarter did not look promising - 1:27, did not feel particularly easy. Next quarter in 1:25, felt harder than the first, but sustainable. Again nothing special. Then 1:22, and another in 1:22, 5:37 for the mile. Nick and Jeff were setting the pace, and I was just following them. The pace did not feel hard, but I've had so many days like that where 5:30 pace early on felt easy, and then after 2 miles I could not sustain it. So I was not getting too optimistic. Next 0.5 in 2:43, and it feels OK, still like a marathon pace. This is encouraging. Nick saw were ahead of the pace and eased off a bit. Next 0.5 in 2:47, 5:30 for the mile, 11:07 at 2. That felt way too comfortable. HR still hovering around 150. 2:49 for the next 0.5, 13:56 at the turnaround. Still feels comfortable, but I am crossing my fingers. Jeff started to struggle and fell back. Oddly enough, we traded places from last week when it was I who struggled exactly the same way - the breathing is fine, but you just cannot go any faster. Nick picked it up a bit. 2:46 for the next 0.5, 16:43 at 3 miles, 5:36 mile. Still feels like marathon pace, maybe a tiny bit too aggressive, HR made its way to 157. Steady pace for the next mile, 5:33, 22:16 with a mile to go. The uphill quarter in 1:23, that brought HR up to 163, but it did not feel 163-miserable. Next quarter in 1:24, feels more threshold like, but still not quite there, then 1:23. Finally the last quarter. The moment of truth. Was I just fooling myself telling myself the pace was easy, was this a mental game, or a real gain in fitness? Ran 69 seconds - this removes all doubt. The fastest I've ever been able to do off anywhere close to that pace before has been 76. This gave us 5:19 for the last mile, 27:35 for the 5 miles, which is a course PR for me, and the last 2.5 in 13:39. Ran 0.1 during the day to find Joseph who escaped from the house on his toy motorcycle. He did not get very far, but this is our family escape distance record for all ages, not just 2 and under. In the evening ran to Reams to get Jacob some diapers, then a mile with the kids, and then 4.04 with a stroller and Jacob in it. Met Scott Hillman and his wife Esther. Scott is going to join us tomorrow. Long run in the morning. Ran the standard 10.04 course twice. First time around easy with Scott Hillman. We chatted in Russian all the way, very relaxed, got 1:15:37, HR stayed below 120. Then a quick bathroom stop at the house, drank a quart of Powerade, and then ran the second half hard. Had a rough time getting into a rhythm on the first mile, but then settled into a nice 5:45-5:50 pace. Hit the 2.5 tempo stretch on the trail in 14:27 on the way out. 29:12 at the turnaround. The tempo stretch on the way back in 14:27. HR hovered in the 150-154 range. 150 felt relaxed, 154 felt like I was working, but still had some gas in the tank. It warmed up a bit at the end, I felt I had to put in more effort to keep the pace, but I could handle it. Picked it up on the last 0.5. Timed the last quarter - 1:23. Came back in 29:07, total time for 10.04 was 58:19, average of 5:48. Total time for 20.08 was 2:13:56. Ate breakfast, helped a neighbor move. Made sure not to carry anything too heavy, left this to the guys with bigger muscles. Started feeling better during the move. Took a nice two-hour nap, felt good afterwards. Ran 2 miles with the kids in the evening, then took Sarah on a date. She rode the bike, and I ran. Started out at 8:00 pace, then gradually eased into 6:30-6:40 pace. HR at first hovered around 127, then as I lost a bit of water it drifted to 130-132 range around mile 5. It is amazing what a man is willing to do to impress a woman, even if he's been married to her for 10 years. Sarah asked me if I was working. I told her, watch, let me show what happens when I am working. So I ran 0.75 in 4:07 with the quarters of 1:24, 1:22, and 1:21. That felt good, like I could hold it for a while, even though I already had about 28 miles on the odometer for the day by that point. I guess the combination of a nap, proper carbo-reloading, and a drive to impress a woman can do wonders. Finished 8 miles in 53:34, out in 27:32, back in 26:02. Record weekly mileage, somewhat unplanned, but I felt good, so I decided to go for it. Ran alone this morning. Decided to be extra-cautious and skip the 2.5 tempo I normally do Monday mornings. When you start getting into a good shape, you are usually just one wrong step away from an injury. Started out at a slower than 9:00 pace. After about half a mile, eased into 8:00. After 2 miles worked my way up to 7:00. When I got to the cow field stretch, the fly were out in full sway. So I picked it up a bit to get through the mess. By the time I got out of it, I got into a nice sub-6:40 rhythm. I figured as long as my HR stayed below 130 on flat parts, this would be OK. It did, so I maintained it to the end. With a quarter to go decided to pick it up to threshold, ran it in 1:23. Ended up with 1:09:38 for 10.04. A short while later ran to Computune to pick up VanGoGo. This time it was the fuel pump. Fortunately, it was under warranty. We count our blessings. The run was 2.25, I ran it at 6:40 pace. In the evening ran with the kids to Kiwani's park dropping them off according to their level of ability on the way as Sarah picked them up. Played tag with them there, then ran back, added a bit to make 6 miles exact. I think some runners feel they need to match the air temperature highs with their weekly mileage. I've counted 4 runners who cracked 100 mile barrier last week - Clyde, Dave Holt, Bill Cobler, and myself. Back in our old ward a few years ago our Elder's Quorum President was also a state trooper. He told us about the 100 mile club - any time they write a citation for 100+ mph, they put it up on the board and the person joins the club. In that spirit, I am going to start a new club on the blog. Anytime a runner cracks the 100 miles in a week, he will be inaugurated. A word of caution - do not do it just to join the club, but only if your body is ready for it, and you can do it productively. Ran with Jeff this morning. 3x2 miles on the Provo River Trail workout with full rest - jog around until the next repetition starts to sound appealing. Warmed up 1.84. The goal was to run 10:50 for each. Did all of them on the standard 2.5 stretch from 0.5 mark to the turnaround alternating directions with the first one going towards the Utah Lake. Ran the first one in 10:36.1 with the splits (by 0.5) of 2:41 - 2:36.5 - 2:38.5 - 2:40. That one felt a bit hard for me, and very hard for Jeff, although he made his way through it. Jogged 600 meters. Found Karl Jarvis on the trail. He decided to join us for however long he could make it. On the next one, just to keep things in check, and to keep myself from working too hard as well, I invited Jeff to lead without feeling the pressure to perform, just run whatever pace felt right to him. He started out with a 1:25 quarter. I really enjoyed it, but knew it would not last. Next two quarters in 1:22, then the fourth in 1:19, 5:28 mile. Karl made it to the mile. Now it looks like we can actually hit this one on target in spite of the early relaxation. Jeff started fading a bit and fell back. I continued at a steady 5:20 pace. Finished it in 10:49.6. Jeff ran 10:57. Jogged 0.75 before the next one. I wanted to make sure I was fresh for the last one. Karl joined us. I set the pace on this one trying not to drop Karl or Jeff for as long as possible without letting up on the pace. Hit the splits of 2:41 - 2:39 - 2:39 - 2:36 (1:18, 1:18) for the total of 10:35.0. Felt good until I started going 1:18 per quarter pace on the last 0.5, but it was not a near death experience like it used to be. I would call it just uncomfortably hard. 1:20 was almost relaxing. Karl made it a bit past 0.5, Jeff fell back early, but then finished strong with the last 0.5 in 2:33 and 10:43 for the whole thing. Ran back home from the turnaround where we finished. Total of 12.8 for the run. Did another 6 miles in the evening, which included kids' runs. Each running child got in his own run. It was not a super easy pace - Benjamin hit his 2 mile run in 15:27 with the last mile in 7:13. Jenny ran 9:00 for the mile. Julia ran 5:36 for 0.5. Easy run on the 10.04 course in the morning. I came up with a new standard easy run plan. First 2-4 miles just warm up, go whatever pace the body wants. It usually starts out at 9:00 pace and warms up to 7:00 by the end of this stage, which it did today. Then on the second stage, run the fastest pace possible with the heart rate not exceeding 130. This usually results in about 6:35-6:40 pace. Then with 0.5 to go run threshold pace if I feel like it, no HR limit. So that is what I did today. Hit the first half in 36:52, came back in 33:02, 1:09:54 for the run. Timed the last quarter, it was 1:23. A little bit of motivational bragging about the evening run. Sarah went with Julia to help a friend paint her house, so I was in charge of everybody else, that is Benjamin (8), Jenny (6), Joseph (2), and Jacob (almost 1). No treadmill. How to get in a decent run, get the kids runs done, and keep everyone reasonably happy? Solution: Put Joseph and Jacob in the double stroller. Benjamin gets on a bike, Jenny runs a mile. She did it in 9:08. Then Benjamin and Jenny trade places. Benjamin runs 1.48 at about 8:20 pace. Then we stop at a park, Benjamin, Jenny, and Joseph play, Jacob watches from a stroller, I go back and forth on a 200 meter stretch nearby for 2.25 miles at about 7:00 average, and catch the 8:00 mile guy for the whole run. Then I tell Benjamin to stay ahead of the 8:00 guy for me on the way back home, and he averages 7:00 on the way home for the remaining 0.52, and almost catches his 8:00 mile guy finishing the run in 16:10. I get 41:06 for 5.25, 54 seconds ahead of the 8:00 pace. Before that adventure, I ran with Julia, and a little bit more to the church and back. So that gives me 16.04 for the day. I got started on the top Fast Running Blog performance list - so far just men in the marathon. To make it more meaningful, I adjusted the performances for the course quality and weather conditions on the day of the race when ranking different runners. This, of course, to an extent is a matter of opinion. If somebody has a reason to challenge my adjustments, or if you discover a factual error, feel free to send me a note. I also got started on the live top mileage list, but there is nothing to show yet. Ran with Scott Hillman this morning. I figured it was about time to show the 5:30 guy who's the boss over my standard 5 mile tempo. Scott paced me through the first and the last 1.5 of it. It was very helpful. Splits by 0.5 - 2:43 - 2:38 (5:21) - 2:38 (7:59, alone after that) - 2:44 (5:22, 10:43) - 2:44 (13:27 at the turnaround) - 2:45 (5:29, 16:12) - 2:45 - now Scott joins me again - 2:41 (5:26,21:38) - 2:42 (uphill) - 2:35 (5:17, 26:55.7 for the whole tempo, last quarter in 76). This is not only my PR for the course by 40 seconds, but it is my loop course 5 mile PR period, including splits from 10 Ks and adjusted 8 Ks. If you add up my first 2.5 K and my last 2.5 K this comes out to about 16:31 5 K, which is the fastest loop course 5 K I've run this year. Right before Ogden and after a back off week, I ran the out and back 3 mile tempo in 16:11. Today the sum of those 1.5 segments was 15:57. HR hovered around 159 for a while, then made its way into 163 area around 3.2, then climbed to 168 on the last mile and peaked at 171 on the kick. The best results from high mileage I've seen so far in my running. Ran a longer cool down - 11.18 for the run. Ran with the kids in the evening plus some more. Total of 6.25 in the evening. Easy 10.04 with Jeff in the morning. Followed the easy run protocol - warm up, then fastest possible pace with HR 130 or under, then threshold pace at the end. Took a while to warm up. Hit the first quarter in 2:26, and it felt fast. At around 0.4 mark my HR was still hovering between 95 and 98. Then I gradually woke up. After two miles we finally started cracking 7:00 pace. Hit the turnaround (5.02) in 37:16. On the way back settled into a steady 6:40 pace. It was tempting to go faster, but I was very strict on the 130 HR rule and backed off whenever I saw it going overboard. With about 0.64 to go Jeff asked me if it was time to speed up. I was originally planning on doing it at 0.5, but I was getting bored with the pace a bit, and tired of the HR restriction, so we decided to pick it up a bit earlier. Timed a 200 up 0.5% grade on the trail - 42, and also the last quarter (flat) - 1:21. Total time 1:10:13. Interestingly enough, in 3:40 of running at that effort my HR gained only 20 bpm from 130 to 150. But I still felt like I was working. I think most of the work went into overcoming the inertia. Also, it started to get a bit warmer. When it gets warm, I first start feeling lazy with the HR dropping a bit for a while, and then after a while dehydration sets it which brings back and HR over the limit. Ran with the kids in the evening. We ran/rode in the stroller/rode a bike taking turns to the swing on a tree and back. Added some more to make the total 5 miles for the run afterwards. Starting a taper for Deseret News Marathon/Draper Days 5 K. The long run tomorrow will be shorter - 13 miles, and easier - no serious speed scheduled in the middle. Ran with Scott Hillman this morning. Very easy pace most of the way, just a bit faster than 8:00. Chatted in Russian, told him some Brezhnev jokes. It is hard to believe that I am old enough to remember Brezhnev speaking on TV. There were 4 channels available in Moscow back in the early 80s, and he would be on 3 of them at the same time. I am not sure if the 4th had him too. One of the jokes goes like this - a man is watching TV in Moscow. First channel - Brezhnev. He tries another - Brezhnev. Third one - same luck. Forth - a KGB man with a fist saying:'"If you keep switching channels, I'll show you where lobsters spend their winter!" After about 6 miles were were done with the jokes and the Russian instruction, and got down to a bit of business - 2.5 tempo on the standard stretch from Utah Lake to Geneva road, so a slight net uphill. Ran the first 200 in 44, and it felt hard. Then ran the next 200 in 42 and it felt a lot easier. Settled into a nice a little slower than 5:30 pace. First mile in 5:35. After that Scott started struggling, so we backed off to 5:40. Went like that until the last quarter. Then picked it up a bit, and even more on the last 100 - ran in it in 16 seconds. Total time 13:56, last mile in 5:30 thanks to the kick. Scott was really out of it afterwards for a bit - he laid on the ground and said he was dead. The Russian word for Sunday literally translates as Resurrection. So I told him in Russian that there was a reason for the day after Saturday to be called the day of the Resurrection. That got him up and we finished the rest of the run. Ended up with a 13.16 total in 1:37:10, incidentally, just a bit over the half marathon. Middle distance runners (Scott being one of them) are interesting creatures. On Thursday, after a warm-up of 2.84 Scott was able to do 2x1.5 at sub-5:20 pace with hardly any apparent struggle. So I thought 2.5 at 5:35-5:40 pace would be anywhere between relaxing and comfortably hard for him. But this time the warm-up was 6.2 miles! So apparently his slow twitch muscles tired out some, and he had to use more of his faster twitch ones more. Today after running 1.5 in 8:26 (5:38 pace) he felt like throwing up. And yet, he still had a kick of 16 seconds on the last 100 meters! Granted, he has more speed than me, probably 1.5 seconds faster in an all out 100. But still, adjusted for that, if I feel like throwing up with a mile to go, I will not run 17.5 on the last 100 meters, maybe 19 with a super-human effort. The difference is that he has some super-fast twitch fibers that do not work at all in a long race or interval. So no matter how badly he is hurting, they are going to be available for the kick. Whereas my fast-twitch fibers are really mid-grade - if I am pushing it even in a very long race, they are working their tail off. So come the finish, I have no kick, I've been kicking the entire race already. However, give me a slightly easier pace to where my mid-grade fibers do not have to work, and I'll run the last 100 almost as fast as I would if I were fresh. Ran with the kids in the evening, and added some more - total of 5 for the evening run. Ran 6 miles with Clyde in the morning. We did a mile in 5:26, felt good. Later started feeling the symptoms of a sinus infection. Attacked it with Dr. Christopher's Sinus Formula, it was effective. However, it reduced my appetite, which is a big minus when tapering. Nevertheless, I did not try to force the food intake beyond the natural levels dictated by hunger figuring it would go to waste anyway. Was concerned about running the marathon with a sinus infection. Then I sat down for my daily mini-piano practice (I try to do 10-15 minutes a day), and learned the right hand of Come Come Ye Saints. As I played it several times and contemplated the words, and the context in which they were written and often sung, as well as the final stage of the route of the Pioneers, which is the course of the marathon tomorrow, I realized that the early Saints had to deal with much more than a sinus infection, and many of them made it to the finish. I also felt thankful for those pioneers, and the pioneers in general. Most the good things we have in life and often take for granted would not be available had it not been for the sacrifice of some pioneer. With that perspective, my sinus infection was not a matter of concern any more. Maybe I will run a bit slower, but I can still run a decent race even with a bit of a challenge to overcome. In fact, having a bit of a health challenge on top of a tough course makes it a more realistic experience in the context of the celebration. Ran with the kids in the evening, this added 1.5 miles. Then headed over to Chad's house to stay with him overnight. Deseret News Marathon, 2:32:54, 3rd overall ($500), 1st from Utah ($500), total of $1000, finally a race with some good financial luck. I have not had very much of it this year. In Ogden, I ran a race that deserved $500-$1000 pay off, but the field was crowded, somebody had to miss the money, and being a bit less fit than the competition gave me that lot. Similar stories in shorter races - crowded field, this is a qualifying year, and the Fast Running Blog has been helping crowd the field as well. Nevertheless, I would much rather see/help create a strong field, and wait for/encourage the race directors/sponsors to make the purse match it than rake in all the money racing against a weak field. Stayed with Chad the night before. Got to see his wife Heather and his little son Jack. Had a nice visit with Paul and James there. Had a runny stomach during the night, got up a few times. On the way to the race was concerned about that. Why? A marathon is a long way to go. Little things tend to escalate. Malfunctioning stomach means the carbo-replenishment will not go in as well. This often leads to an early bonk. Nevertheless, figured if I run conservatively, I could offset the stomach glitch, as well as the effects of the sinus infection the day before, and still run a decent race. Weather conditions were good. Cloudy skies, no extreme temperatures. Got to the start, usual routine, then the gun went off. Bill Cobler went into the lead. I stayed with Steve Olsen, Walter Brown, Jon Ndambuki, and Paul Rugut. We coasted at around 5:20 pace on the steep sections. Then Ndambuki and Rugut decided to take a potty break. I picked up the effort (not the pace, as the drop grade decreased), and ended up running alone. Ndambuki and Rugut wasted no time bridging the gap and caught me pretty quick. At around the same time (near mile 4) we went past Bill Cobler. I saw that the Kenyans were slowing a bit, and caught up to them. We ran together until mile 6. 6 miles in 32:43. HR was very reasonable on that section. Down 7% it hovered around 140, then it was around 155 as it flattened out. Then they started pressing up the Little Mountain. I decided to keep my heart rate around 160 on the climb, and if I could keep up with them at that effort, go, otherwise, just let them take off. They were going significantly faster than what I could manage comfortably with the effort appropriate for the marathon. I ran the 7th mile in 6:25, and they put about a 20-30 second lead on me, this is up a 3-4% grade. On the 8th mile my runny stomach gave me some problems, and I had to make a quick bathroom stop. No big deal, lost no more than a few seconds on it. Got over the Little Mountain, 45:18 at 8 miles. Just trying to run relaxed. Hit the little uphill subdivision loop. The Kenyans now had about a 2:00 lead. Saw somebody who I at first mistook for an early started, should have paid better attention to his form, it was Peter Vail (I think). He was maybe 40 seconds behind. He was surprised to see me, and made a comment to the effect of, what? you're third? I did not understand the meaning of the comment at first. 10 miles in 56:40, 13 miles in 1:13:16 (this gives me about 1:13:52 half), 15 in 1:24:12. Then to my surprise I heard steps behind me. Peter Vail was gaining on me. I did not like that, but I did not know what to do either. Then I noticed he was not gaining as quickly on the downhill sections as he was on the flat ones. I also remembered that he struggled quite a bit with the downhill in 2004. So I started surging on the downhills. Clyde joined me soon after 15 miles. I kept doing my downhill surges, and it worked. First I increased the gap to a minute, and then there was no sight of Peter (or whoever that was). Felt strong 15 through 20, and thought that for sure I would run no slower than 2:30 with some seconds, and maybe even a bit under 2:30. Hit 20 miles in 1:53:42, and it is all downhill from there, and with a cloud cover to make things easier. However, my downhill surges combined with not being in the best health combined with a less than normal taper (only one week of 60 vs 80-51 the year before) started to take its toll. I slowed down to 6:20-6:30 pace and did not feel like I could go any faster. The legs felt beat up, and I felt a little weak (although not terribly). Not feeling a threat from behind, and knowing that the Kenyans had a mile lead and not slowing down was also a factor. So I coasted to the finish at that pace. The last 2 miles seemed to take forever, but not too bad. For some reason there were several timing mats at the end separated by quite a bit of distance. I assume one set was for the 10 K, while the other set for the marathon. Not sure which one was which. So I made sure to keep running until I've crossed all of them, and timed myself on the last one. Based on that, my finish time was 2:32:54 with the last 10 K in 39:12. Ndambuki won with 2:22:24, Rugut was second about a minute behind. Steve Olsen was 4th with a low 2:44, Bill Cobler 5th with a low 2:48, and Walter Brown struggled big time on the last 2 miles, but still managed a 2:51 finish. Carol Cabanillas won the womens with 2:53. She hoped for a trials qualifier, so she is probably disappointed. However, I am sure she does not mind a $2507 paycheck. Legs were sore afterwards, but I think not as sore as last year, which would be good. We'll see tonight and tomorrow. Legs, mainly quads were to sore to run productively this morning, although I could have forced it, and a year ago actually did when they hurt worse. This time I decided to wait until the evening. In the evening, they were slightly better. I ran a mile in 9:17 with Jenny and pushing Jacob in the stroller. The pain was bearable, but I still felt running more would not have been productive, so I decided to do some biking instead. So I rode my standard 10.04 course. 28:07 on the way out, but I made a few stops and did not stop the watch, 22:33 on the way back. My bike has some issues with gears, the frame is too short for me, and it is a 30lb mountain bike. It also took me about 8.5 miles to figure out that if you stand up and pedal really hard for a bit, then you can sit down and just coast, and you end up going a lot faster with the same effort. So I was going about 4:20-4:30 pace most of the way. At the end, once I figured out the trick, I hit the last quarter that had 2 90 degree turns in 62. So I figure two miles of biking is about a mile of running, so I'll count this ride as 5 miles. Legs still sore this morning, so I biked my 10.04 course. For a change, took off the Jones counter and wore tights instead of my regular street pants the night before. This made quite a bit of a difference. I rode the course in 39:05. First half in 19:12, second in 19:53. That includes a number of slow downs due to sharp turns, getting through a construction zone, and going around pedestrians on the trail. When there were no obstacles, I was going 3:30 mile pace (around 17mph) fairly comfortably. This is on a 30lb mountain bike that is not in great condition - the main problem is that the frame is too short and the saddle does not get up high enough. The chain is also rubbing some against the gear shifting lever and on top of that you cannot go into the highest gears, but on that trail I did not feel the need - the position of the seat relative to the pedals would not allow me to put forth enough power for a higher gear anyway. However, when I got up, I finally started feeling right, except there was no seat underneath me. And, of course, no clips. Would anybody familiar with biking venture to predict how fast I might be able to go on a nice road bike with everything in proper condition? And what rank this would earn me in a bike race. Ted suggested at one point that my quads might be better suited for biking than running, and in theory that could be a reasonable idea - in running you are pretty much stuck with your biomechanics, while in biking there are a lot of things you can change - the size of the bike, gears, etc, so if you have raw power, it should be easier to find a way to use it. But theory is very different from practice. Ran 0.5 with Julia in the afternoon, and then 1.5 with Benjamin and Jenny in the evening. The leg pain is gradually going away, but is still making me run funny. But at least I feel like screaming only half the regular volume. You can see why the prize money at DesNews attracts so little competition relative to other marathons. My legs are not even sore after any other marathon, and this one brings me to this! Easy run with Jeff and Adam - 10.04 course. Legs still sore, although a lot less. Could not break 8:00 pace for a while. Got to the turnaround in 41:01. On the way back started edging up on the 8:00 guy. Finally around 7.5 accidentally accelerated to 7:00 pace, and then the legs were too sore to slow down. Picked it up on the last quarter, ran it in 1:28. 1:17:51 for the run. Ran with the kids in the evening, total 2.5 miles. My legs were still sore today, but not as sore as yesterday. I could walk down the stairs without the urge to scream. My intuition told me they will not get any worse from running 15 miles with a 5 mile tempo in the middle. I thought it would give me a nice "big workout" (term borrowed from Tinman). I think he is on to something with that. Best marathoners train in a number of different ways. But one thing in common is that they frequently run for 90+ minutes at once. It could be Zatopek's 40x400, or it could be Viren's 50 mile jog around a big lake, or it could be something more conventional - 20 miles with 10 hard at the end. There is a common theme around my good marathons - frequent and properly balanced runs of 90 minutes or more. So I ran with Jeff to the end of my 10.04 course, then back to the start of the 5 mile tempo. It started to get warm. My legs were feeling the pain. Jeff noticed that my stride was shorter than his. Normally it is longer. I did not have my normal quad power, so I had to compensate with higher turnover. Nevertheless, we managed about 7:00 average for the first 8.7 miles of our run. I had second thoughts about the tempo, but figured I could slow down to whatever I needed to be able to finish it, and whatever I got would be a benchmark of my current level of recovery. loss of power in the quads - this a big deal for me. I have thought about this issue for a while. My opinion is that one's ability to balance the quad and the hamstring well is a function of the condition of the lower back. A more biomechanically talented runner (minority of the runners) will have the lower back in proper balance and will use quads and hamstrings in a more effective proportion. A less biomechanically talented runner (majority of the runners) will have issues in the lower back that will force him to rely on the quads more. 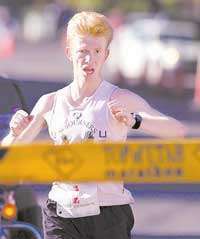 Thus he will never negative or even -split a marathon without running below his potential because even though he may have the fuel reserves left in the second half, his quads are partially disabled due to the cumulative pounding impact in the first half, quads being the primary shock absorber, and he cannot do much without them. Whereas the other type of runner does not suffer as much from the loss of quad power because his hamstrings are better utilized, and they are not a major shock absorber, so if they have the fuel in the second half, they can go. So I was pleased with the run. Finished the rest barely fast enough to keep the 6:40 guy off our backs - 1:39:41 for 15.04. Ran with the kids in the evening - total of 2.5. Legs felt a lot better today, although still not 100%. The quads are still weaker, and fatigue easily. The plan was for an easy 10 in the morning, and then go another 2 in loops around the block if that felt right. Had to be back by 7:30 for Sarah to leave on her run, and I left at 6:21, so I had to hustle. After one leisurely quarter fairly quickly got up to 7:10 pace. Then saw Lance Barker, and ran with him. He originally was going to run up to the Y, but I was able to persuade him to run a 5 mile tempo. I did not have any desire to run through town to get to the Y trail, nor to climb the Y, nor did I have the time to do it. And I did not want to run alone. I am glad Lance was so easy to persuade. Our original plan was to run 6:20 pace. Lance did not think he could sustain 6:00 or even 6:10. We ended up running 30:39 (avg 6:08) with the splits of 6:10 - 6:09 - 6:17 (going around a fallen tree twice and with a 180 turn) - 6:05 - 5:58. Lance outdid his expectations by quite a bit. My legs felt more tired from this run than they should have been. So I decided to do only 10. Total time for 10 miles was 1:09:31. Ran with the kids in the evening. 0.5 with Julia, then to the swing and back with Benjamin and Jenny trading places on the bike, and pushing Jacob and Joseph (another 3.5). Afterwards added a mile in 6:57. It felt very good form-wise. I attribute this to the effects of increased time on the inversion table - I went from 2 times a day of 5 minutes to 2 times a day of 10 minutes. But again, I've seen so many random fluctuations while trying new things, so I am not that excited yet. Running puts my mind into a higher thinking plane. I am able to think more positively, solve problems, and look at things with a better perspective. Tonight somehow the meaning of the phrase "faith of a child" caught my attention. Having run without prolonged breaks since childhood has done something interesting to my memory. I believe because there is a connecting theme since I started running, I remember that portion of my life very vividly, like it was yesterday. Anything before that I remember no better than the average adult. So in a moment of contemplation the time came into my view when I was about 14 years old. Many of my friends had quit running at that time and were asking me why I still kept going. I did not have a reason to give them. I felt stupid not being able to give them a reason, but I did not even have a reason to give myself. But something very deep down in me that I did not understand, but I could not deny or ignore was telling me that something precious would die if I went along with my friends and quit just like them. Of course, now I see the wisdom of that decision. I am better off than them or where I would have ended up otherwise because of that choice in many ways. I was able to stay away from alcohol and tobacco, learn how to work, learn how to overcome challenges, and eventually ended up finding the LDS Church, developing faith in Christ, and being able to have my family thanks to that decision to keep going early on. But how did I know? And how did I find the strength to not only feel the right way, but also follow it when nobody did. At that time, everybody who I would have considered a possible role model had disappointed me in some serious way. There was nobody to follow. I believe God gave me a gift, and did so for a purpose. I am thankful for that gift. I hope that same gift I could use a child will be available to me for the rest of my life. Sasha House 10 miler in the morning. Legs are not sore any more, but feeling still weaker. Got bored, threw in a 1.5 mile tempo to wake up/get going in 8:30. First mile in 5:46, the remaining 0.5 in 2:44. Total time for 10.04 was 1:09:41. Ran with the kids in the afternoon. Julia has been having some motivational problems lately, not uncommon for a 4 year old. We addressed them by reading the Little Engine That Could. So she yelled I think I can pretty much her entire run. That made it quite a bit faster. Instead of her standard 5:30 - 5:50 for 0.5 she ran 5:07. Then ran with Benjamin and Jenny for 2 miles (pushed Jenny after the mile in the stroller) in 18:13. Then ran 2.5 on my own in 17:28.